How Far is Jains Abhineet? Jains Abhineet is a residential Project developed by a Renowned developer in Chennai Jain Housing & Constructions Ltd in Villivakkam locale, A promising place where the investment made will be appreciated in the present and future, well planned with lots of open area a right mixture of Luxury and comforts with best in class amenities one of a kind property in the vicinity. 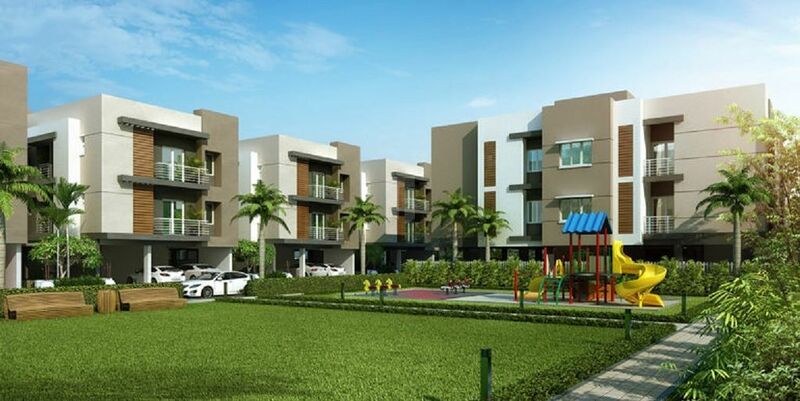 The Project offers 1.5 BHK and 2 BHK flats for sale In Villivakkam with all the facilities an occupant required, where 1.5 BHK flats super built-up area is 800 Sq ft and spacious 2 BHK flats super built-up area is 900 Sq ft. This Project is in Villivakkam, A place located in Chennai, it is a residential area famous for temple, A premium place where most of the working-class people are there, situated between Industrial Estates of ICF, Padi, Ambattur, Perambur Loco Works, this place has best connectivity through public and private mode of conveyance and even train station is in the vicinity. Jains Abhineet contains amenities so that the residents can have a comfortable life, some of them are Gym, Clubhouse, Children's Play Area, Security and more. Kitchen will have first quality ceramic wall tiles for 2 feet above the platform level. Toilet will have first quality ceramic wall tiles for 7 feet height from floor level. Service areas will have ceramic tile for 4 feet height all around. Note: Size, Color and brand will be of our choice depending on bulk availability. Black granite of size 8’0”x2’0” will be provided. RCC platform will not be provided. Porcelain sink/Stainless steel sink without a drain board will be provided. One loft of RCC will be provided in the kitchen. Main door will be made of teak wood frame with Paneled skin door shutter. Bedroom doors will be made of teak wood frame with flush shutters. Toilet doors will be made of teak wood frame with flush shutter, with one side PU coated. UPVC/Aluminium French doors with sliding shutter without grill will be provided. UPVC/Aluminium sliding shutter will be provided with grill for all the windows. Aluminium ventilator for toilets will be provided. All walls will be coated with putty and finished with emulsion paint. Ceilings will be finished with OBD. External walls will be finished with exterior emulsion paint of Asian/ICI/Dulux or equivalent paint. All other doors will be finished with enamel paint. Windows and Ventilator grills will be finished with enamel paint. Three-phase supply with concealed wiring will be provided. The actual supply will be single or three phases based on the TNEB rules and regulations at the time of energizing the complex. Separate meter will be provided for each flat in the main board located outside the flat at the place of our choice. Common meters will be provided for common services in the main board. Split A/C provision with electrification will be provided in all bedrooms. 3(three) nos. 15A plug points will be provided in kitchen & 1(one) no. 15 A point will be provided in Service area for washing machine.1(one) no. 15A point in each toilet for Geyser. The wiring for 5A points will be of 1.0sq.mm rating adequate for equipments of capacity of 750W and 15A points will be of 2.5sq.mm rating adequate for equipments of capacity of 1500W. AC wiring will be of 4 sq.mm which can take up a capacity of 2 tones. Standby generator for min. essential points in common areas will be provided. TV and Telephone points will be provided in Living and Master bedroom. The cables for TV and Telephone will be provided at a suitable location in living & all bedrooms. Note: Alterations, Fixing of grills and placement of A/C outdoor unit in elevation will not be entertained under any circumstances. All toilets will be provided with floor mounted closet. Dining will be provided with washbasin. High quality chromium plated fittings of Parry ware/Hind ware/Cera or equivalent will be provided. An overhead tank of 1000 litres capacity for Metro water either constructed in civil masonry / Readymade PVC tank will be provided. An overhead tank of 2000 litres capacity for bore water either constructed in civil masonry / Readymade PVC tank will be provided. An MS ladder will be provided up to headroom lvl. 1no. of domestic Lift with minimum capacity will be provided. Rainwater collection well rings of 3’dia of 5’depth of 2nos. will be provided for each plot. Common meters will be provided for common services in the main/panel board. 6 nos of CCTV Surveillance Cameras shall be provided at appropriate locations in common areas for security reasons. Common Gym and indoor games will be provided at plot – 3/1 for the entire project. Common Party lawn & Children’s play area will be provided in OSR(open space reservation) for the entire project. Readymade security cabin will be provided at plot – 1/1, plot 2/1 & plot 3/10 for the entire project. Compound wall will be provided only at the peripheral area/boundary of the entire project not in-between individual plots. No individual compound wall shall be provided for individual plots. All the open area in-between the buildings shall be landscaped & planted. Sewage and water supply shall be provided based on CMWSSB norms. Rainwater collection well rings of 3’dia of 5’depth of 2nos. will be provided at party lawn. Common Trenches & storm water drain will be provided along the 24’ wide roads and — 16’ wide passage. Bitumen top / Paving will be provided for 24’ wide road & 2nos. of 16’ wide passage. 3nos of Servant/driver room & toilet will be provided in stilt floor for the entire project.